Locke, California was placed on the National Register of Historic Places in 1971. The town was built in a time of racism and prejudice against the Chinese, and served as an out of the way refuge for Chinese farm hands who lived in the area. The original townsite was a collection of three Chinese owned buildings called Lockeport built in 1912. Due to exclusion laws Chinese could not own land. So Tin Sin Chan and others approached George Locke, a Sacramento Merchant, for permission to lease his land about a mile north of Walnut Grove, California. 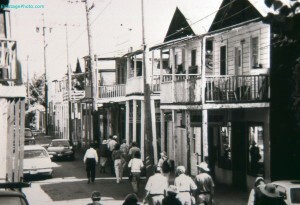 Locke main street – from sometime in 1980. Formerly a Chinese enclave, now on the National Register of Historic Places. In late 1915 a fire broke out in the Chinese section of Walnut Grove, severely damaging the buildings. Due to language and slight cultural differences, the Chinese population fragmented into two groups. The first group, mostly from Toi Shan, decided to rebuild in Walnut Grove. But those from the Chung Shan district decided to relocate the mile north to Lockeport and rebuild there. As a result six new buildings were built and by 1920 the name had shorted to Locke, California. The town population fluctuated drastically due to an influx of seasonal workers. By the 1940’s the full time population was 400-600 residents and went up to 1000-1500 as Chinese workers came to get jobs on nearby farms. Modern Locke now has a full time population of roughly 70 people, ten of whom are Chinese. 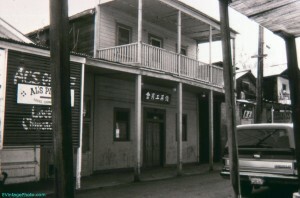 Retro photo from sometime in the 1980’s of “Al the Wop’s Saloon and Restaurant” and the Dai Loy Musuem in Locke, California. When I first saw these two slides with the naked eye I thought that due to the Black and White film that these pictures were much older then they are. I made the assumption it was New Orleans, Mobile Alabama or some other Southern United States City. Imagine my surprise when I saw how modern the clothing people were wearing and the cars parked in the street were! Has anyone here been to Locke, California or even heard of it before?